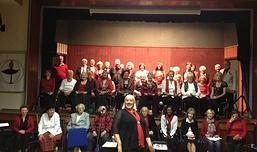 New fun choir singing different styles of songs; pop, rock, folk, show tunes, funny, lyrical, African/world music, English, Americana, jazz, chants etc. Some will be a capella, some with piano accompaniment, some with backing tracks. Some cannons and rounds, simple harmonies and close harmonies. The songs will be taught by ear with lyrics sheets and some CDs/MP3s but not sheet music. All abilities, no experience needed and no audition. The aim is to have fun, make new friends, enjoy singing and work towards some local performances and community events. Cost £4 – £7 a session.